The Hotel Paleokastritsa is a 3 star resort in a stunning location right on the hillside overlooking the bays below. If you decide to venture out for the day or evening, local bars and restaurants are only 450m from the hotel. 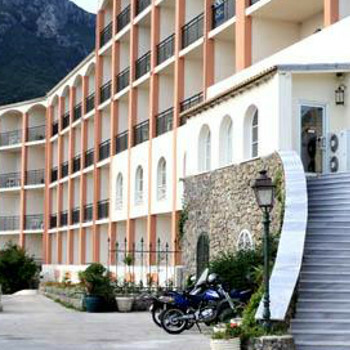 I spent a week in Paleokastritsa Hotel in August 2005. Undoubtedly,Paleo is the most beautiful part of Corfu island. It is a clifftop Hotel,the view was beyond description indeed! The sea shore was too pebbly to walk on,so we missed it out on! Anyway,as the guide told us,the sea is the coldest at Paleokastritsa,and it was proved for us after we made an attempt to go into the sea.Then we avoided the sea,altough it was absolutely pristine,clean,you could see to the bottom of it really! About the hotel: We paid for the cheaper room,so we did not see the sea itself.Cleanliness,well it was not perfect at all,since there were marks of toothpaste on the mirror,there were pieces of hairs on the floor,there was massive filth under the bed,and in a 4 star hotel,I do not think you should pay for the tv remote control,and for the air conditioner remote,as well. True,we got back our money at the end of our holiday,it was just advance payment. Anyway,We paid for half board,so we got breakfast and dinner.Food was very good,we could choose from a wide range of foods,but unfortunately we had to pay for the beverages!If i wanted to dring something,even a mineral water,i had to pay immediately,which was so disappointing. At a 4 star hotel!! !Drinks should have been for free,shouldn't they? There was no drink for free at all.Not even the milk. Food and drink is very expensive in Corfu,as well as the entertainments. By the way,there are a couple of bars,tavernas/how they call them,restaurants/ in Paleokastritsa. If you want discos,you won't find them in Paleo,i mean we havent even looked for one. Staff were more or less friendly. The room we paid for,was kind of small for us,we had difficulties in finding enough space in our room. The swimming pools were good,but the bars right beside the pools closed too early,so if we were hungry,we had to walk a lot to find a taverna. you will find some "Greek Night" shows,where people dance,and smash plates in the end.